The Inflation rate for March 2018 is 10.4 per cent, a drop of 0.2 per cent from the 10.6 per cent recorded in February last year, Acting Government Statistician, Baah Wadieh, has announced. At a press conference in Accra on Wednesday, 11 April, Mr Baah Wadieh said two main components; food inflation and non-food inflation, accounted for the drop in the rate. He revealed that food inflation rate for March 2018 was 7.3% (compared with 7.2% recorded in February 2018) and the non-food inflation rate for March 2018 was 11.8% (compared with 12.2% recorded in February 2018). “The inflation rate for imported items was 11.8% in March 2018 (compared with 12.1% recorded in February 2018). “The inflation rate for locally produced items was 9.8% in March 2018 (compared with 10.0% recorded in February 2018),” he said. “Five regions (Upper West, Brong Ahafo, Greater Accra Ashanti and Western) recorded inflation rates higher than the national average of 10.4% . 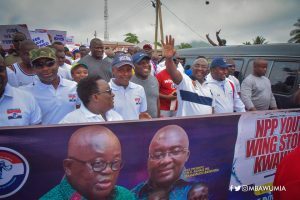 “Upper West region recorded the highest year-on-year inflation rate of 11.9%, followed by Brong Ahafo region (11.3%), while the Upper East region recorded the lowest year-on-year inflation (8.0%) in March 2018,” he added.